The next step, after reading the three key points of typing, is to learn how your hands and fingers should be positioned on the keyboard. Look carefuly at the next picture to see how your hands and fingers should be positioned. Each of your fingers should rest on one key. Using this ten-fingers position you minimize the distance from all keys to your fingers, so, with a minimum effort and practice, you will be able to type really fast! 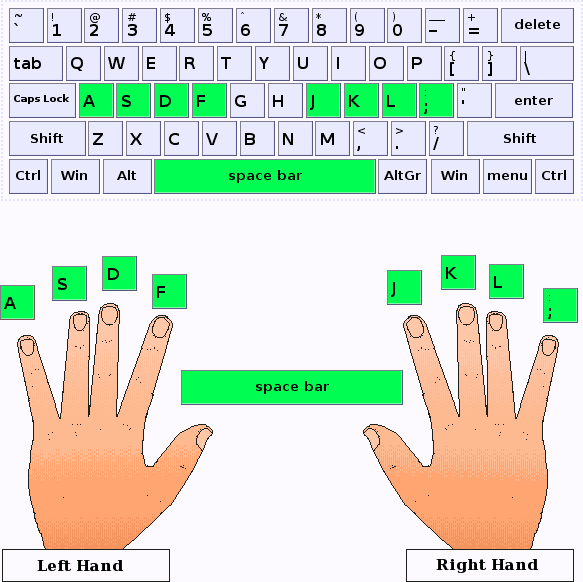 This ten fingers technique is also named touch typing, and it has been widely used for long, long time. It is the same technique that nowadays everybody will teach you, even if you go to a private school. There is one trick to know if your fingers are well positioned without looking at the keyboard. Rub the F and J keys with both indexes, do you notice the bumps? The file where your fingers rest is known as the home row. That will help you to stop looking at the keyboard. That's it! That's all theory you need to know for this lesson. Now that you know the theory, come on to the practice!